Tri This . . . . . . . . . . . . Fleck's Blog: Will You Watch? What Happens When You Take the 5-Rings Away? Will You Watch? What Happens When You Take the 5-Rings Away? Did you watch the Winter Olympic Games from Pyeongchang, Korea over the last few weeks? You were not alone. Thanks to CBC Sports and their great coverage, millions of Canadians tuned in to watch, our best Winter Sports Athletes compete against the best in the world. Based on these exceptional viewer numbers from the Olympic Games, we seem to want to watch our best Canadian Athletes compete at this level. However, did you know that, right now, and through this weekend, two other World Championships events - the IAAF World Indoor Track & Field Championships and the UCI Track Cycling World Championships are on - and Canada has medal contenders in both events. Will you be watching either one, or both? 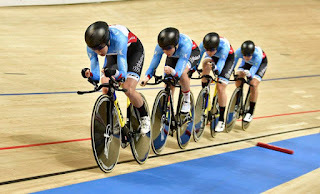 Again - CBC will thankfully have Live Streaming Coverage for the Indoor Track & Field Championships and the UCI has their own YouTube Channel for the Live Stream of the Track Cycling World Championships (links below for both)** . However the viewer numbers in Canada, with some of Canada's best Track & Field, and Cyclists taking part, will pale in comparison to the numbers who watched the Winter Olympic Games just over a week ago! And so we enter into that fallow, period between Olympic Games (now two years between the alternating quadrennial Summer & Winter Olympic Games), when most Canadians tune-out watching most of the Olympic Sports. Years ago, the excuse was they are not available to view - and that was true. However in the current internet age and the advent of streaming coverage, almost anything you want to watch sports-wise, regardless of how rare and obscure it is, is available via some form of streaming service to any kind of device - even your mobile phone in the palm of your hand, anywhere, where you are! My client Athletics Canada in fact has a partnership with RunnerSpace - the top level providor of Streaming coverage of Track & Field and Running in North America, to stream, with top-level commentary talent, and production, many of their marquee, event properties and other races of significance each year. So the excuse, that "you can't see/find" these sports and the coverage of them, does not add up anymore. So why is it that Canadians who are so keen to watch our best compete against the best in the world, in the Winter & Summer, Olympic Games, when those same athletes are competing in, just as prestigious and competitive races/events, such as a respective sports World Championships, most Canadians are oblivious? Is the attraction of the 5-Rings, that powerful? Later on this year, in August, Canada and Toronto, will host the NACAC Track & Field Championships (NACAC = North American, Central American & Caribbean region) at Varsity Stadium, right in downtown Toronto. There is no IAAF World Championships (outdoor) this year - but there will be IAAF Regional Championships, like the NACAC Meet here in Toronto. It's worth noting, that in some races/events, the (100m - 400m) sprint events in particular, You could potentially have a Olympic Final, or World Championship Final, made up of athletes just from the NACAC region - so their will be truly World Class competition at the NACAC Championships in August. Flipping over to cycling, Canada will again host, a leg of the UCI Tissot World Cup Track Cycling tour later on this year at the Mattamy National Cycling Center in Milton, ON - home for Track Cycling at the 2015 Pan Am Games in Toronto. The dates for this are Oct 26-28. This will be year-two for this exciting event, after a VERY successful first effort by Cycling Canada, back in December of, last year, that saw nearly sold-out crowds cheer on the best track cyclists in the world - some of whom are Canadian! Will you watch sports like Track & Field and Cycling, in these in-between years - between Olympic Games, either via Live Streaming online, or live and in-person, at the two events mentioned above? If your answer is, "no" - I'm very curious as to why, you will not be watching? What happens when we take the 5-rings away?